Mary reminds us of the fact that God is our Savior. We do not have to redeem ourselves. He saves us in her Child, the Messiah. He rescues us from guilt, fear, meaninglessness and hopelessness; sets us free to love and hope; gives us a path to walk that leads to a good end. There is no such thing as a hopeless situation anymore. We can let him save us, can be happy about God's promises. And, just like Mary, who responds to God's saving deed with her song of praise, we should celebrate God as our Savior. God chose Mary to be the Mother of his Son. He did great things for her, in her lowliness. Mary belongs to the lowly ones, the poor, the small; to those who are on the look-out for God, who listen to him, She belongs to those who reflect on life from God's point of view and cherish his word, those who let him save them, those who obey. Only for the lowly can God do great things. When God looks upon a person in her lowliness, he gives her his honor, his dignity and uniqueness. God's holiness gives a person protection and dignity. Mary invites us to belong to the lowly and the poor so that God can do great things for us too. Mary recognizes the mercy of God as it accompanies her people on their way. This mercy reaches its climax in her Child, the Son of the Father. God's mercy is from age to age – unceasingly. In every muddled situation a person can rely on this. For God is faithful. Mary's song tells us we all depend on God's mercy; the Church is to be a place of God's mercy; we ourselves should be merciful as God is merciful. In Mary it becomes quite clear to us that God reverses this world's scale of values. The proud, the mighty, the violent are scattered, deposed from their thrones, made ineffective. The lowly--to whom Mary belongs--the poor, the powerless who expect everything from God are raised to high places, becoming a blessing for others. That is why the Church should open herself to the might God has shown, and reject pride, vanity. Thus, in a world of so much violence and oppression, she can be a sign of hope for the poor, for those who are powerless, oppressed and persecuted. Mary stands for the hungry who, in the poverty and barrenness of life, long for God's promise, for his peace, his word and his salvation. The promise that God gives every good thing to the hungry is fulfilled in her. It is fulfilled in us too if we do not have a satiated heart, but are hungry and thirsty for God's justice; if, in a world of hunger, we seek to relieve the bodily hunger of those in need and their hunger for God's promises. Mary is linked with Abraham, the forefather of Israel, the father of the promise. In the coming of the Messiah, in Jesus Christ, God's faithfulness is sealed conclusively and in an unparalleled way. The Mother of the Savior becomes the sign of the Lord's faithfulness. The People of God can depend on their God. In hope, calmness and fearlessness they can rest assured in the company of his Son on life's path. 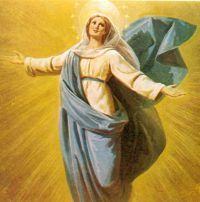 Mary's very existence points to God and to her Son. In her response to God's initiative, through her faith, she sets the pace for the Church, for the faithful. That is how Mary's song, the Magnificat, becomes the song of the Church, our song. Source: From a prayer leaflet distributed by the Diocese of Rottenburg, Germany. Occasion: the Marian Year 1987/88.